FC Halifax Town could move back into the play-off places in the National League North if they win at Alfreton on Tuesday (7.45pm). Town will still need other results to go their way, but could regain fifth place in the table with a win or a draw. The Shaymen go into the game having collected 10 points from their last 12 available, having beaten Chorley, Tamworth and Salford and drawn with Stockport in their last four matches. 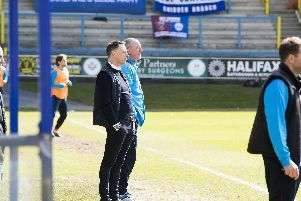 The game will be Alfreton boss Nicky Law’s last home match in charge of the club before he leaves for a backroom role at Burnley after Alfreton’s game at Gainsborough on Saturday, February 4. Law has been in charge at Alfreton for 10 years and has also managed Grimsby Town, Bradford City and Chesterfield in the Football League, leading the latter to promotion from the fourth tier in 2000/01. Alfreton are one place and four points above the relegation zone, but with two games in hand. Only rock-bottom Altrincham have conceded more goals in the league than them, but only four teams in the division have scored more goals. They have won just one in their last seven league outings but are unbeaten in their last seven home matches in all competitions. Alfreton have two former Halifax players in their squad in winger Adam Smith and midfielder Paul Marshall. Danny Hone is available for Halifax after serving a four-game suspension.